In this blog series, we highlight stories shared with us by TriMech clients about how we have helped to improve their business with our software and hardware solutions, training, and engineering services. In this client story, we're highlighting a company that credits SOLIDWORKS Electrical for cutting their design time by more than half. This client develops and manufactures small water treatment units used primarily at medical specialty clinics. For each unit, there is a small control panel with an operator interface, control electronics and wiring to sensors, valves and pumps. Prior to working with TriMech, they were using 2D CAD and spreadsheets to document their schematic designs and develop supporting documentation. To streamline their electrical design processes, the company upgraded to SOLIDWORKS Electrical Schematic and Electrical 3D. With their upgrade, they decided to send two team members to training held at their local TriMech office. After training, the client's head design engineer used the new software immediately on a retrofit project. He quickly became proficient with the software and has been using SOLIDWORKS Electrical on every project since. Why Does This Client's Story Matter to You? After training and implementation, this client significantly decreased their time to market. By saving 50-75% just in design time, a project that previously took one month with 2D CAD tools is now complete in one to two weeks! SOLIDWORKS Electrical allowed them to streamline production through the use of easily generated wire lists. This cut out the time-consuming and often error-prone task of interpreting schematics for the information they needed, fiscally benefiting the company as a result. Each day they realize the advantages and efficiencies afforded by using SOLIDWORKS Electrical as they continue to develop and enhance their company using this innovative software. 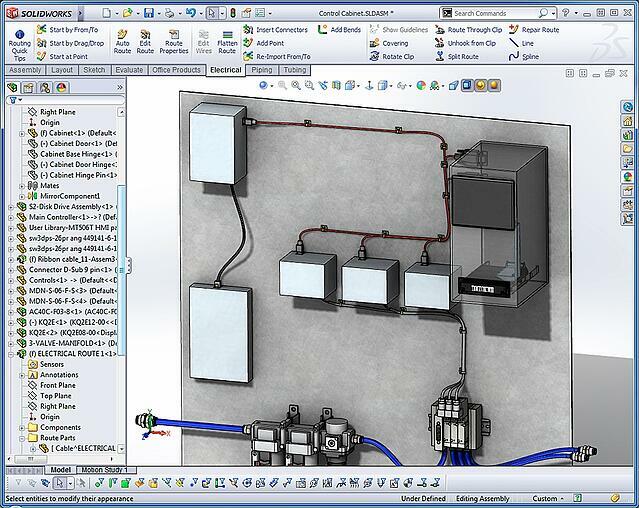 Curious to see SOLIDWORKS Electrical in action? Contact us to find out how to improve your schematics, design workflow and more.